It can be humbling to be rendered illiterate when traveling in a country with an alphabet alien to your own. Street signs are meaningless and attempting to withdraw cash from an ATM with directions in Chinese characters is all but impossible for those of us accustomed to Germanic and Romance languages. I’m certainly grateful for street signs that have English translations when wandering some of the world’s cities. 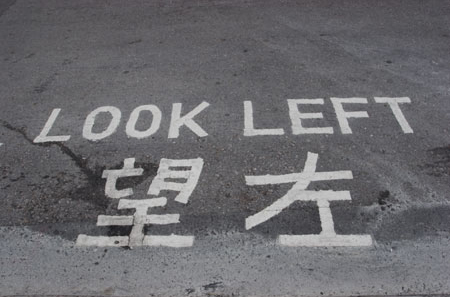 In Hong Kong you’ll see many signs reminding pedestrians to look left instead of right when crossing the road. The direction of traffic in Hong Kong is a legacy of the former British Colony, where driving is on the left instead of the right. I wonder what “Mind The Gap” looks like written in Cantonese. In Tokyo’s vast metro system girly pink signs on the platform point out which cars are reserved for women only during rush hour. They were introduced in 2005 to prevent chikan from doing what they shouldn’t do. 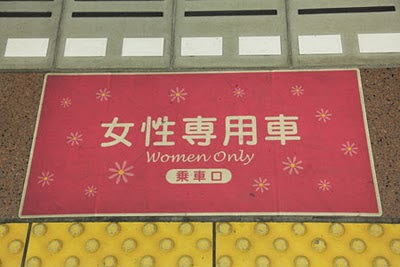 This sign is not in China. 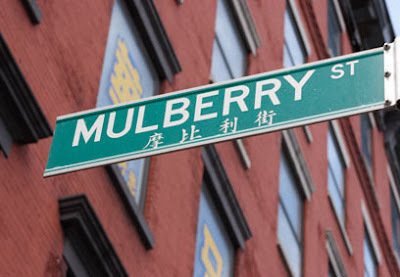 In fact it's located in Manhattan’s Chinatown, which borders Little Italy and its famed Mulberry Street. When has a bilingual sign helped you from getting lost or lack of one resulted in an unplanned adventure? I always appreciate blingual signs. They really helped in Brazil when I was lost in Rio. Kristina, It's no coincidence that the signs I chose for this post all feature Asian languages. Fly Girl, I hope I have the opportunity to get lost in Rio one day. Would love to see it. Very nicely illustrated, Wendy. Twenty years ago, when living in Japan, it was the multilingual Citibank automatic teller machines that saved us, as well as the vogue for using English words on just about all products in the supermarket. There was one time, though, when I bought what I was sure was toothpaste -- and this was an exception, where there was nothing in English on it. It tasted so bad, though, that I had to spit it out immediatedly! I'm surprised that there were multi lingual ATMs 20 years ago in Japan. They are def life savers. The Hong Kong sign is really interesting, because in countries where cars drive on the left side of the road, people usually look RIGHT left RIGHT and not LEFT right LEFT. So why would the HK sign tell people to look left I wonder? Perhaps it was a one-way road?